Throughout our community you will find a true mark of quality in every room. Each kitchen is complete with modern fixtures, including energy-efficient appliances and polished glass top stoves. You can find additional features throughout each home such as washers and dryers, beautiful garden-style tubs and spacious walk-in closets to store your entire wardrobe. Select floor plans feature built-in bookshelves perfect for your personal library and fireplaces that you will enjoy on chilly nights. This apartment home features 9-ft ceilings adorned with crown molding throughout the foyer, living, and dining rooms. This spacious layout also includes a built-in computer desk and book shelves for your convenience. The bedroom is large enough to fit a king sized-bed and has an ample walk-in closet just waiting to be filled! The bathroom has a large vanity with plenty of storage options and the garden tub is just the right size. The kitchen is fully renovated with energy-efficient, black appliances that include a microwave, dishwasher, glass-top stove, and refrigerator. A stackable, energy-efficient washer and dryer is also included. This apartment home features 9-ft ceilings adorned with crown molding throughout the foyer, living, and dining rooms. This spacious layout also includes a built-in computer desk and book shelves for your convenience. The bedroom is large enough to fit a king sized-bed and has an ample walk-in closet just waiting to be filled! The bathroom has a large vanity with plenty of storage options and the garden tub is just the right size. The kitchen is fully renovated with energy-efficient, black appliances that include a microwave, dishwasher, glass-top stove, and refrigerator. The patio/balcony for this home offers plenty of space to enjoy a beautiful day and even has room for a hammock! A full-sized, energy-efficient washer and dryer is also included. This apartment home features 9-ft ceilings adorned with crown molding throughout the foyer, living, and dining rooms. 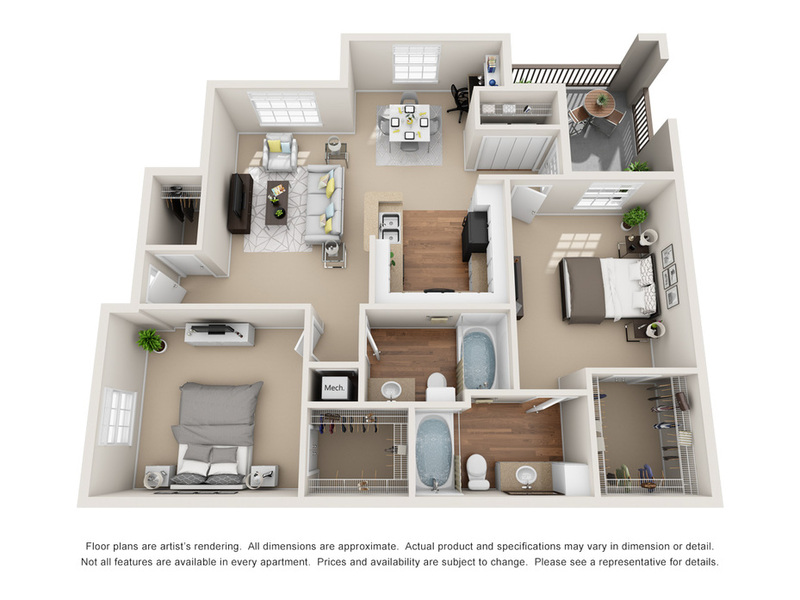 This spacious layout also includes a separate area off of the dining room with a built-in computer desk and book shelves for your convenience. The bedroom is large enough to fit a California-king sized-bed and has a large walk-in closet just waiting to be filled! The bathroom has a large vanity with plenty of storage options and the garden tub is just the right size. The kitchen is fully renovated with energy-efficient, black appliances that include a microwave, dishwasher, glass-top stove, and refrigerator. The patio/balcony for this home offers plenty of space to enjoy a beautiful day and even has room for a hammock! A full-sized, energy-efficient washer and dryer is also included with plenty of laundry storage space. 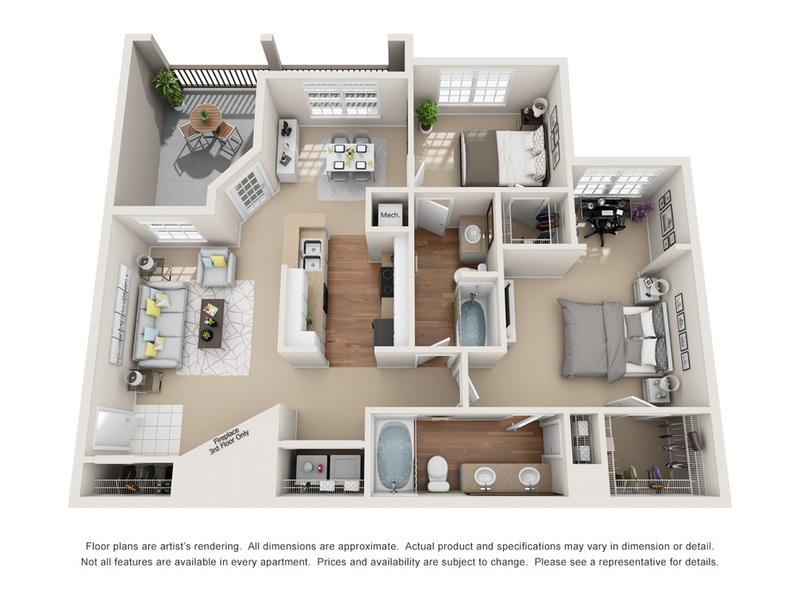 Our most popular two-bedroom, the Greenbriar is designed to welcome you home! The garden-level layout offers our signature 9-ft ceilings with crown molding throughout the living and dining rooms. A large, floor to ceiling book shelf adds to the coziness of this living space! The fully-renovated kitchen overlooks the living room with an added bar feature. Plenty of countertop space in the kitchen allows lots of room for gourmet cooking and our energy-efficient, black appliances give this kitchen the sleek and modern look to please any pallet! Both bedrooms have a ceiling fans and feature spacious walk-in closets with plenty of room for large bedroom furniture. The master bedroom also includes an additional office/study space perfect for curling up with a good book or as a private area to work from home. Each bathroom includes a bathtub and shower feature with additional storage in the vanity. The master bathroom includes a garden tub with an extended vanity space that includes "his and her," side-by-side sinks. The patio/balconies for the Greenbriar are large enough to entertain both friends and family with room to spread out and enjoy the peaceful quiet of our community. A full-sized, energy efficient washer and dryer is included. Only four of these exist at The Reserve! 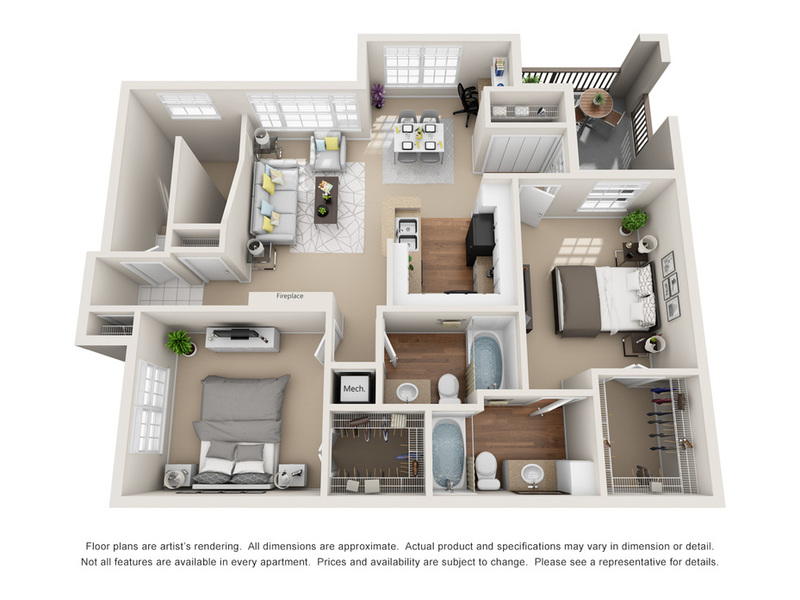 The Biltmore floor plan offers unique, spacious living with a looming, 12-ft foyer that immediately welcomes you in. A staircase leads you to the loft-like layout that also features our signature 9-ft ceilings adorned with crown molding. The living room offers room to explore your design potential and offers a warm and welcoming, wood-burning fireplace. The dining room also includes an added built-in computer desk with book shelves to help keep you organized. Plenty of countertop space in the kitchen allows lots of room for gourmet cooking and our energy-efficient, black appliances give this kitchen the sleek and modern look to please any pallet! Both bedrooms have ceiling fans and plenty of room for large bedroom furniture. Walk-in closets are included in each bedroom and are large enough for even the most avid shopper! Each bathroom includes a bathtub and shower feature with additional storage in the vanity. The master bathroom includes a garden tub with an extended vanity space that includes "his and her," side-by-side sinks. The patio/balconies for the Biltmore are large enough to entertain both friends and family with room to spread out and enjoy the peaceful quiet of our community. A full-sized, energy efficient washer and dryer is included. This apartment home is a rare gem! A looming, 12-ft foyer welcomes you into this spacious two bedroom. A staircase leads you to the loft-like layout that also features our signature 9-ft ceilings adorned with crown molding. Plenty of countertop space in the kitchen allows lots of room for gourmet cooking and our energy-efficient, black appliances give this kitchen the sleek and modern look to please any pallet! Both bedrooms have a ceiling fans and feature spacious walk-in closets with plenty of room for large bedroom furniture. Each bathroom includes a bathtub and shower feature with additional storage in the vanity. The master bathroom includes a garden tub with an extended vanity space that includes "his and her," side-by-side sinks. The patio/balconies for the Tremont are large enough to entertain both friends and family with room to spread out and enjoy the peaceful quiet of our community. A full-sized, energy efficient washer and dryer is included.